Lemonade takes on an ultra-summery and refreshing form in this Lavender Lemonade Slushy! Combine lavender buds and sugar in a large bowl. Pour 2 cups boiling water over mixture, stir, and let sit for 30 minutes. Strain lavender buds from sugar water then combine with 1 cup of cold water and lemon juice. Taste test, adding more sugar or water as needed (it should be a bit sweeter than regular lemonade). *Alternatively, freeze the lemonade in an ice cube tray. Pop lemonade ice cubes into a high-powered blender and puree into a slushy. 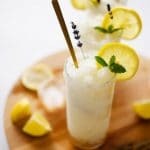 Recipe from Live Eat Learn at https://www.liveeatlearn.com/lavender-lemonade-slushy/.